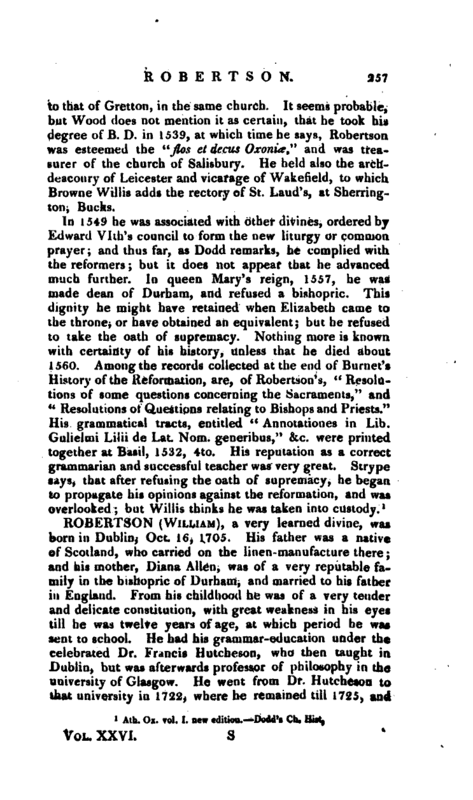 , an eminent grammarian, was, according to Bale, “Eboracensis urbis alumnus” which may mean that he was educated at York; but Wood says, he was born at or near Wakefield in that county. He was originally of Queen’s college, Oxford, but afterwards a semi -commoner of Magdalen, and succeeded the famous John Stanbridge as master of the school adjoining to that college. He took his degree of M. A. in 1525, and was elected a fellow of Magdalen. In 1532 he was collated to the prebend of Welton-Westball in the cathedral of Lincoln; in the year following to that of Sleford, and in 1534, | to that of Gretton, in the same church. 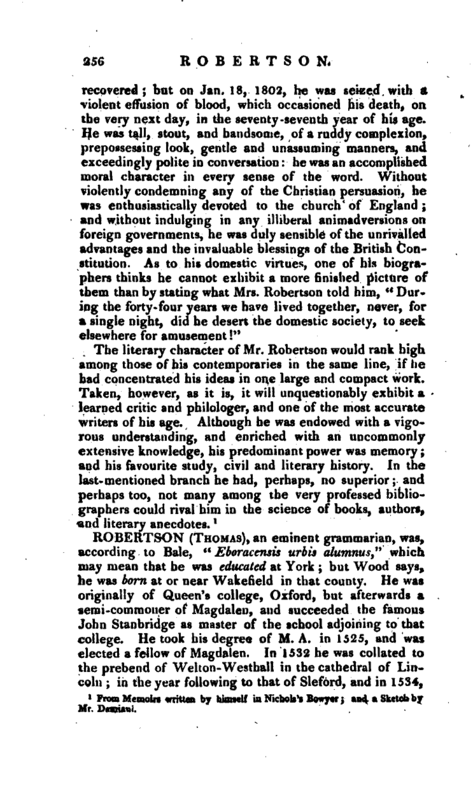 It seems probable, but Wood does not mention it as certain, that he took his degree of U. D. in 1539, at which time he says, Robertson was esteemed the “fas et decus Oxonite” and was treasurer of the church of Salisbury. He held also the archdeaconry of Leicester and vicarage of Wakefield, to which Brownie Willis adds the rectory of St. Laud’s, at Sherrington, Bucks. Ath. Ox. vol. I. new edition.- Dodd’s Ch. Hist.